It lasted only a few decades, but this period in the mid-1800s had a significant impact on our region, as settlements were linked, mail was managed and groundwork was laid for future transportation systems. Illinois entered the Union from the Old Northwest Territory in 1818, but settlement in the northern part of the state didn’t accelerate until after the Black Hawk War of 1832. Pioneers and others first followed trails made by wildlife and Native Americans, journeying by foot, horseback or wagon. As the population increased, so did commerce and the need for roads and better transportation. Before the railroads reached the upper Midwest in the 1850s, and before the Illinois & Michigan Canal was completed in 1848, which linked the Great Lakes with the Illinois and Mississippi rivers, the stagecoach became the predominant mode of overland public transport for passengers and mail. 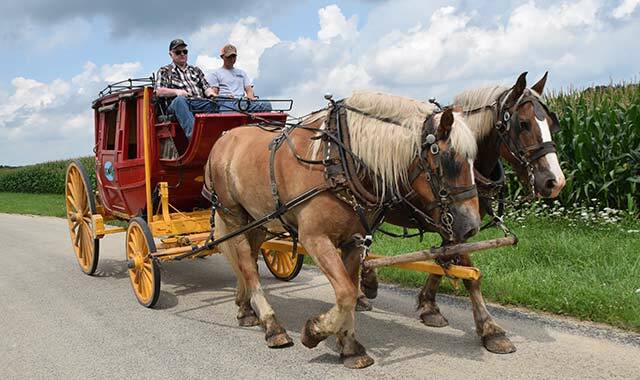 The vehicles were called stagecoaches because they completed their scheduled routes in stages, traveling from stop to stop where tired horses could be exchanged for fresh ones and passengers could sometimes eat, rest or sleep overnight. Sometimes brief stops were made just to exchange mail or horses. The roads in our area were created, in part, to link the lead mining region around Galena in Illinois and Mineral Point in Michigan Territory (now Wisconsin) with the emerging port of Chicago to the east, Peoria on the Illinois River to the south, and towns like Madison and Milwaukee to the north. Stagecoach routes were chosen not just for the convenience of passengers, but also to accommodate the timely collection and distribution of mail. Without mail contracts, most stagecoach lines wouldn’t have survived. The Postal Act of 1792 established the role of Postmaster General and made the U.S. government responsible for creating post offices and distributing the mail. Private contractors were soon hired to transport the mail between post offices, and by 1823, the Postal Service had perfected the hub-and-spoke delivery system. The first post office in northern Illinois opened at Galena in 1826, five years before Chicago had one. During the 1820s, John D. Winters ran stages between St. Louis and Galena, and in 1834 established another route between Ottawa and Chicago. Stagecoaches ran twice a week on this route for the one-and-a-half day journey, charging $5 per passenger. John Taylor Temple started his stagecoach company in Chicago in 1833, and a year later it was carrying passengers and mail between Peoria and Chicago. In 1837, a major player in the regional stagecoach business entered the picture, John Frink, an entrepreneur and former driver from Connecticut. After partnering with several other businessmen, Frink joined forces with Martin O. Walker in 1840, creating the partnership that would eventually dominate the stagecoach business in Illinois, Iowa and Minnesota, until Frink’s death in 1858. Frink seems to have provided the political and operational know-how, while Walker (often as a silent partner) provided cash and business experience. Freeport became a regular stagecoach stop in 1837, with Winters running his stages between Chicago and Freeport, and Frink & Walker stagecoaches meeting Winters’ passengers in Freeport, where they continued on to Galena. In 1838, Frink & Walker extended their line to Chicago, forcing Winters out of business. Their stagecoaches left the Chicago depot at 128 Lake Street (later moved to the southwest corner of Dearborn and Clark streets) at 6 a.m. on Tuesdays and Saturdays, carrying mail and four to seven passengers. The scheduled stops included Dixon’s Ferry (now Dixon), Freeport, Lena, Millville, Apple River, Scales Mound and Galena. In good weather, the trip took five days. Another Frink & Walker route took Chicago passengers to Elgin, Belvidere, Midway (now Rockford), Freeport and on to Galena. This route from Belvidere to Freeport took essentially the same path as US route 20 does today, and for some time was called the State Road. The company’s stage barn for changing horses in Rockford was located at the intersection of State and Third streets. Originally built for Daniel Haight, one of the town’s earliest settlers, the building had many public uses before becoming a horse barn, including as the first meeting place for Rockford’s Congregationalist and Methodist churches. The now-vanished town of Millville grew up on the Apple River in northern Jo Daviess County, where the stagecoach trail between Chicago and Galena intersected a north-south trail to Peoria. Its location is now contained within Apple River Canyon State Park; most of the town washed away in a big flood in 1892, from which it never recovered. For a number of years, however, Millville was considered “the only town of importance between Freeport and Galena” because of its strategic location. This northern branch of the Chicago to Galena route is today designated the Stagecoach Trail Road, and includes county highways 6, 13 and 3. It leaves US 20 west of Freeport and passes through Lena, Nora, Warren, Apple River and Scales Mound, before descending into Galena. Several buildings once used as stagecoach stops and inns still stand in these communities. Along with a general store and a post office, a tavern was often one of the first buildings constructed in a new settlement, after the initial homes were built. These inns were more than drinking establishments, and when they became stopovers on a stagecoach line, they functioned like our modern motels, providing food and rest for weary travelers. The completion of the Illinois & Michigan Canal in 1848 sounded a death knell for the stagecoach business in our area. Connecting Chicago to the Illinois River at Peru, it operated 70 canal boats over its 96 miles of inland waterways. Nearly 100 passengers and all of their luggage could ride regularly scheduled packet boats at a leisurely 5 miles a day, eating and sleeping on board. Stages were still utilized during the winter months when the canal was closed. Railroads, the other nail in the stagecoach coffin, began reaching this area in the early 1850s, and operated year-round. Entire town were created and others forgotten, depending on the routes chosen by the rail lines. Some stagecoaches supplemented the railroad system for a time, connecting railheads with towns yet to be reached by rail, or by serving those that had been bypassed. In 1852, for example, the Galena & Chicago Union Railroad trains were met by stagecoaches in Cherry Valley for the rest of the trip to Galena, and in Belvidere for passengers headed to Beloit, Janesville or Madison. By the 1860s, the stagecoach era essentially ended in our region. But the road system it used, and the towns, post offices and inns that it linked, became the basic infrastructure for the settlement and future economic development of the region. Although we no longer hear the tinny blast of the driver’s horn or the crack of his whip, the roar of wheels and the panting of horses, we still get from place to place on some of the same trails they followed as they blazed their pathways through our region. Editor’s note: Although gleaned from many sources, this article is primarily indebted to Roger A. Matile’s book, The Stagecoach Era in Northern Illinois, published in 2010. “The ears are the antennas,” says R.J. Spillane (right). Here, he and grandson Ryan Kruger drive Sadie and Sam as they pull their hand-crafted Concord-style coach. R.J. Spillane, 72, operates Stagecoach Trails Livery on County Highway 3 (also called Stagecoach Trails Road) just west of Apple River, in Jo Daviess County. Since 1986, he has offered rides in a replica of a Concord coach, on local trails that were part of the original stagecoach routes in the 1840s and 1850s. Spillane and his friend, Ken Koester, 76, from Scales Mound, have constructed replica coaches for 20 years and are currently working on their eleventh edition. Spillane got the idea for the business while traveling out West, but was unable to purchase a coach at regional sales events. His daughter eventually photocopied some original prints of a Concord coach from a school library, and Spillane remembers spending almost 15 hours measuring the dimensions to create a replica. Starting from scratch “with a pile of wood and some iron,” he completed his first stagecoach within two years. He obtained the wheels and other curved parts for the quarter panels from an Amish company in Indiana. Spillane also constructs and refurbishes chuck wagons and other historic conveyances, and offers chuck wagon dinner rides. Spillane’s trail rides follow routes that still show evidence of the original wagons and coaches that traversed the area. A few years ago, he repaired a bridge on the route that had been damaged in a flood. Spillane uses big Belgian draft horses to pull his coaches and wagons, heftier animals than were used historically. He owns three, all 18-year-old mares, and all named by his daughter, Connie: Sam, Sadie and Sid. They each weigh about 2,000 pounds and are hitched as two-horse teams. According to Spillane, Koester has forgotten more about horses than most people ever learn. In addition to Spillane’s animals, Koester has driven teams pulling circus wagons in the Circus World Museum parade, in Baraboo, Wis., since the 1960s. 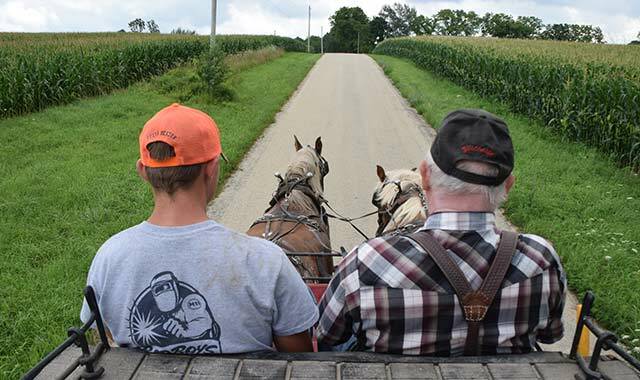 This year, his 40th year there, Koester drove a four-horse hitch in the parade in July. Spillane’s family moved to our region from the Southwest in the 1850s. He was born and raised on a farm north of Galena in the Vinegar Hill region, and came to Apple River in 1964. There were two main types of stagecoaches used in this area, the Troy/Albany and the Concord. The Troy/Albany mail coach was manufactured in Troy, N.Y., and consisted of a flat-topped light carriage seated on leaf springs. It could carry nine to 12 passengers, when using front and back seats on the coach roof. Lewis Downing and J. Stephens Abbot built the sturdy Concord coach in Concord, N.H. Narrow and top-heavy, weighing about 2,000 pounds, the Concord could carry more baggage and freight than the Troy/Albany coach because it had a triangular leather boot in the back for cargo. The passenger compartment was about 4.5 feet tall and 4 feet wide, with front- and rear-facing bench seats, sometimes with an additional seat in the middle, seating nine to 12 passengers. A door on each side held one glass window, flanked by at least two open windows, each with adjustable leather or canvas curtains to keep out dust, bugs and weather. 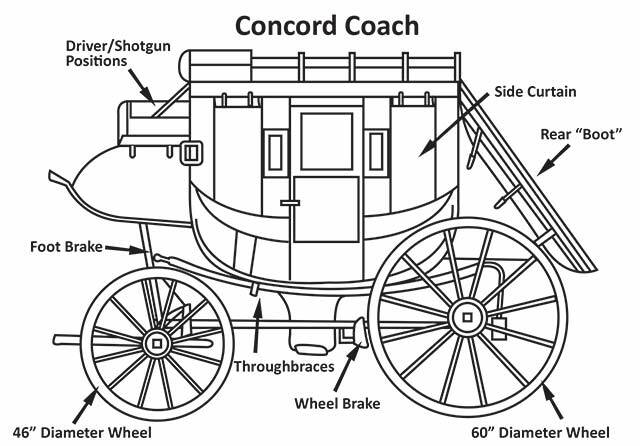 The oval-shaped coach rested on leather thorough braces, which are 3-inch thick, 6-inch wide rawhide straps, cured to the toughness of steel, and strung in pairs to support the coach body and allow it to swing back and forth. This cradle-like motion was intended to absorb the shocks of the uneven road for the benefit of horses and passengers alike. The loose, hammock-like motion made some passengers ill, but it also permitted the coach to work up its own assisting momentum when it was stuck in a muddy road or stream. Passengers sometimes used fence poles to assist in freeing a coach from such situations. They were also often required to walk up steep hills or even to help push the coach uphill. The driver sat in the front boot on a seat about 8 inches lower than the roof. Experience and age varied, but most drivers were under 40. The driver’s main tool of control, aside from the reins, was the coach whip, consisting of a rigid handle 6 to 8 feet long, and a leather lash twice that length. The noise of the cracker at the end was used to control and direct the horses, who were seldom if ever struck by the whip. Coaches were usually hitched to a 4-horse team, each animal weighing about 1,200 pounds. Distance between stops to change horses varied from 15 to 40 miles, depending on terrain. “A good driver or hosteler could hitch up a team in 20 minutes to an hour,” says Spillane, “depending on how many horses you’re using, and how dirty they are. There’s a lot of work involved. If you leave dirt under the collar or harness straps and they start to sweat, you will gall [chafe] the horse. Because of its high ground clearance to override stumps and ford streams, the coach had a high center of gravity and could tip over easily. Many passengers, including such notables as the Sac chief Black Hawk, while on his trip to Washington, D.C. in 1833, were toppled from their stagecoaches during a difficult ride. This entry was posted on Thursday, September 8th, 2016 at 12:00 pm	and is filed under Features, Top Posts. You can follow any responses to this entry through the RSS 2.0 feed. Both comments and pings are currently closed.